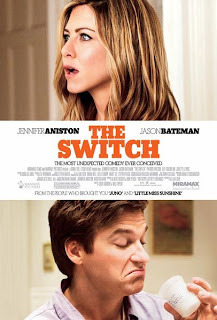 Under the suspicion this was going to be the better of the two romantic comedies based around the concept of sperm donors I have seen the past week, I had pretty high hopes for 'The Switch' despite some harsh reviews. How I feel though is simply this-critics sometimes if not most times look to deep and expect too much. Not expecting too much as in "I know you could do better" but in terms of "This should have been something that it never will be." If I am losing anyone so far, I apologize, to make an example of what I am trying to say can be found in the critical reactions to 'The Switch'. This is a romantic comedy and we all know rom coms have a formula that many stay very close to in regards to big Hollywood productions. To criticize a film that has been labeled as a rom com that has the gaul to focus more on a relationship between son and estranged father rather than the one between the child's mother and distant admirer says something I think. When a romantic comedy creates characters that can't be summed up in one sentence has to mean something. To give it to you straight, I did not perceive this film as a by the numbers romantic comedy or even a dumb comedy nor did I feel it to be inauthentic or removed from reality at all. These are a few of the complaints I've read and so even though I knew this would be much better than 'The Back Up Plan', I was starting to doubt if it would be "as good as it could be". Turns out, the movie is a heartfelt and very genuine comedy about one man learning a few lessons after he makes a life altering decision while in a drunken state. Bateman is a wonder here, he creates the character of Wally as someone we don't necessarily like at first, but we grow to gt to know him and so we forgive his pessimism and his unfiltered mouth that seems to cause him more stress than anything else. We see why he is the way he is, but we never really feel sorry for him, not in the beginning anyway. The film moves along at a slower pace than it sometimes needs, but the script creates some great parallels, not only in Wally and Anistons son Sebastian, but just in story. Things unfold and come to light with a "real" sense of progression, and a vibe that is simply inviting. With Aniston on the poster with Bateman you may expect her to be a bigger part in this than she actually is, not saying that she doesn't have much less screen time than Bateman, but this is really his story. Her wanting to have a child only sets up what is certainly more vital to changing his life course than hers. Aniston is always a pleasure when playing second fiddle to a male lead that can really hold his own and Bateman does that here with an easiness and charm that screams natural. We know the second we meet young Sebastian that he is Wally's not just because we witnessed Wally replacing the donors ingredient with his own, but because there is simply a connection there. A bond that is at the heart of this movie. The relationship between Wally and Sebastian is what made this film stand on its own two legs in the crowded world of romantic comedies. We see a focus that cares more about giving us a real sense of what Batemans character is going through rather than force Aniston and Bateman to become a couple quicker and then discover Sebastian fits in perfectly with the plan because he is in fact Wally's son. Not saying that Aniston and Bateman don't have chemistry, they actually bounce off one another really well-we want to see them become the family Sebastian is yearning for, but a romantic comedy that keeps its audience waiting until the last scene to confirm what we hoped and kinda knew would happen all along actually happen gets kudos from me. Give it a break critics, its not a french art house film, but what makes those better than a movie where you see a man make a real transformation and connect with a son in a way he never imagined. Nothing I think so ease up off its back and simply take it for what it is. A genuinely good romantic comedy.